The George A. Weiss Pavilion (at left), (Almanac November 9, 2010) Penn’s intercollegiate athletic weight training room and recreation center within the north arcade of Franklin Field, has been recently been certified LEED Gold by the United States Green Building Council (USGBC). Penn had applied for LEED Silver rating but exceeded that standard. The state-of-the-art Robert A. Fox Fitness Center inhabits the space of the arches on two levels and connects the interior concourse space under the stadium bleachers with the new east-west exterior pedestrian promenade. Weiss Pavilion exhibits one of the University’s oldest architectural traditions—preservation through adaptive reuse. The former site of parking spots has been revitalized by 52,000 square feet of space that includes a weight training facility for Penn student-athletes; a fitness center for students, faculty, and staff; and retail establishments. 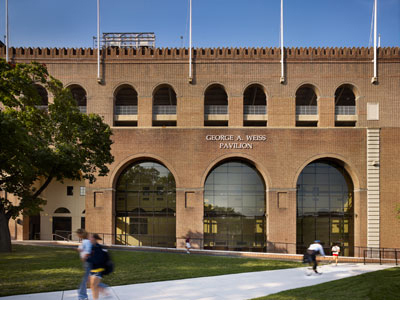 The project’s innovative combination of excavation and infill has redefined Penn’s hundred-year-old football stadium and has added new usable space without increasing the building’s footprint. Approximately 95 percent of demolition and construction waste from Weiss Pavilion was diverted from disposal in landfills by salvaging, reusing, and recycling materials. The excavated soil from the site was utilized in the construction of the landforms at Penn Park. Inside the facility, high efficiency restroom fixtures reduce water use by up to 30 percent. High performance building systems optimize energy performance and a green cleaning plan implements sustainable cleaning products and methods for better indoor air quality. While natural light accompanies views to Penn Park and the future site of Shoemaker Green from the first and second floors of the Fox Fitness Center, glass panels embedded in the concrete outside the façade allow daylight to reach even the basement, which houses a state-of-the-art varsity strength and conditioning center. Weiss Pavilion is Penn's fifth facility to become LEED Certified, following the Perelman Center for Advanced Medicine (Silver), Music Building (Gold), Morris Arboretum Horticulture Center (Platinum), and Joe's Café (Gold, Commercial Interiors). 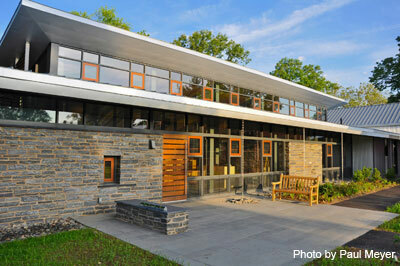 Penn’s Environmental Sustainability Committee has been seeking LEED certification for all new buildings since 2008. LEED® (Leadership in Energy and Environmental Design) is the nation’s preeminent program for the design, construction, and operation of high performance green buildings. The Morris Arboretum of the University of Pennsylvania was awarded Platinum Level LEED Certification, the highest rating of the United States Green Building Council (USGBC) for its new $13 million Horticulture Center at Bloomfield Farm (at left), across the street from the Arboretum’s public garden (Almanac November 23, 2010). It’s the first LEED Platinum certified building for the University of Pennsylvania, and only the second in the state of Pennsylvania. Environmentally friendly design features at the new Horticulture Center include an efficient ground-source heat pump that will provide heat and air-conditioning for the building, photovoltaic panels that provides on-site generation of renewable energy and other sustainable elements, including geothermal wells to help keep office temperatures comfortable, green roofs that showcase drought-tolerant plants and cisterns that catch rainwater and make it available to be used to irrigate the landscape. The Center provides flexible work space for the Arboretum’s horticulture, education, maintenance, and facilities staff, providing important infrastructure for staff and equipment. The 20,840-square-foot facility provides space for staff to manage their extensive responsibilities for the Morris Arboretum’s 167-acre property in the most efficient and cost-effective manner possible. The Horticulture Center, a model for eco-friendly construction, combining natural elements with contemporary design, was designed by architects from Overland Partners, of San Antonio, TX, Muscoe Martin of Philadelphia’s m2 Architecture, and Andropogon Associates, the Arboretum’s Philadelphia-based landscape planners since 1977. The contractor for the project was W.S. Cumby. The mechanical, electrical and plumbing engineer was Bruce Brooks & Associates, and the site/civil engineers were Hunt Engineering. 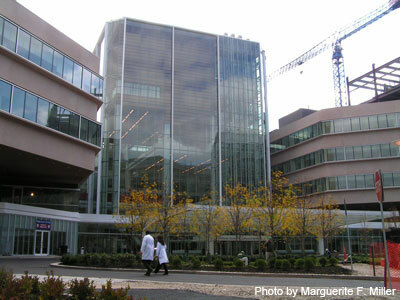 The Perelman Center for Advanced Medicine (at left), designed by Perkins Eastman and Rafael Viñoly Architects, was built to create a comfortable and easy-to-navigate environment for patients and their families (Almanac October 7, 2008). The soaring glass atrium creates a central welcome space adjacent to a café and retail space. The Perelman Center conserves resources, reduces carbon dioxide emissions and encourages environmental stewardship. Built with recycled, locally-sourced materials and wood from sustainable forests, it is 15 percent more efficient than older buildings and is among only a few US hospitals to earn the prestigious Silver LEED certification for “green buildings.” The Center will keep approximately 3,700 metric tons of carbon dioxide—the amount produced by 700 cars—out of the environment each year. A green housekeeping program uses non-toxic chemicals to clean, and the building stocks only recycled paper cleaning products. Energy saving components include motion sensor lights and 21 electric car charging stations in the underground garage. Bike racks and shower facilities encourage employees to bike to work. 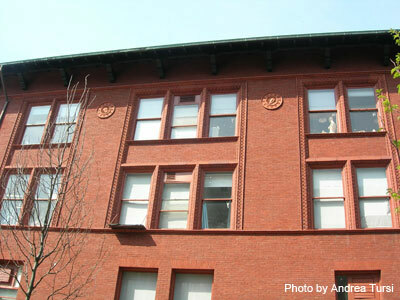 When the Music Building (at left) was renovated in 2010, it was originally designed to meet LEED Silver requirements, but it exceeded these targets with efficient lighting, occupancy sensors, controls and mechanical and plumbing systems, passive storm water management techniques, reduced site water use with selection of drought resistant plant species and “smart” controls that adjust irrigation based on rainfall levels. Also noted, when it was certified LEED Gold, were the project’s recycling or salvaging 95 percent of construction waste, its use of recycled and regionally produced construction materials such as steel and concrete, its interior finishes and Greenguard-labeled furnishings made with sustainable and recycled materials as well as the ongoing use of “green” housekeeping methods and cleaning products. The exterior facade includes louvered sun shades, reducing heat loads. The project was designed by Ann Beha, Architects (Almanac April 27, 2010). 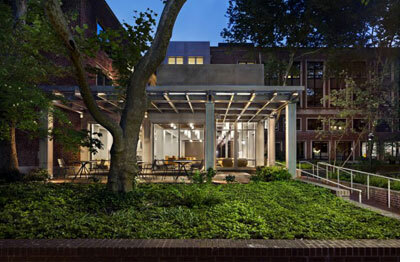 Joe’s Café, a new eatery in the Wharton School’s Steinberg Hall-Dietrich Hall (at left), was built to achieve a LEED Gold designation for its commercial interior renovation, food-service practices, recycling, composting and chemical-free cleaning methods. The Café—Penn’s first sustainable commercial interior—replaces a smaller café that closed in 2009. It was designed by Voith & Mactavish Architects, LLP (Almanac March 29, 2011). The concept of a sustainable cafe was conceived when Penn launched its Climate Action Plan in 2009, outlining strategies to reduce the University’s carbon footprint, including incorporating green building methods, increasing recycling and decreasing waste output and energy use. Joe’s Cafe earned two innovation credits that recognized going above and beyond to green the facility—one for green cleaning and the other for sustainable café operations. At Joe’s, the staff has incorporated green cleaning by minimizing and often eliminating cleaning chemicals altogether, and where they are necessary or required by law, environmentally-preferable products are sought out. The Café was also recognized for sustainable café operations: for providing local, organic and healthy menu options, as well as committing to divert 50 percent of total waste from landfills via a combination of recycling and composting, both pre- and post-consumer.